The Siena Community Center boasts 39,000 square feet of high-end amenities to support an exciting lifestyle. Siena was built by Sunrise Colony Company, between 2000 and 2006. Now that development is complete, the community includes 2,001 homes that are available on a resale basis. These homes feature both attached and single-family designs in sizes and prices that meet nearly any budget. Siena's impressive amenities include two spacious clubhouses and a variety of outdoor activities. 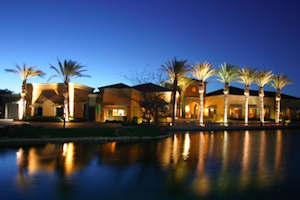 The community is also home to the Siena Golf Club, where residents enjoy discounted rates. The Siena Golf Club features a 15,000 square-foot clubhouse which houses a golf pro shop and the Siena Bistro Restaurant. Its 18-hole golf course, designed by Schmidt-Curley, offers challenging play for golfers of all skill levels. Beyond golf, Siena includes numerous social and recreational amenities. The Village Center amenity complex provides 71,000 square feet of indoor amenities spread across the Community Center clubhouse and the Siena Health and Fitness Center. Siena's 39,000 square-foot Community Center offers a perfect setting for club meetings, classes and activities. The facility offers hobby and game rooms, arts and crafts studios, meeting rooms, a library, a computer room and a business center. It also houses the 7,200 square-foot Sunrise Ballroom, which is an ideal space for many community events. Siena residents enjoy beautiful grounds with lush landscaping and impressive architecture. The Siena Health and Fitness Center makes it easy for residents to stay in shape. This 15,900 square-foot facility features a state-of-the-art fitness center with cardiovascular and strength-training equipment, as well as an aerobics and dance studio, and an indoor lap pool. Residents can also relax with rejuvenating treatments at the full-service spa, get a massage or enjoy the sauna and steam room. Outdoors, Siena's grounds offer many additional recreations, beginning with a resort-style swimming pool and spa area. There are four lighted tennis courts, four horseshoe pits and two bocce ball courts. Homes in Siena include both attached duplexes and single-family designs. Duplex homes are thoughtfully designed in sizes ranging from 1,040 to 1,378 square feet. They each include one or two bedrooms, a den, one-and-a-half or two bathrooms, and an attached two-car garage. Single-family homes range from small, affordable villas to sprawling estates, with floor plans sized from 1,235 to over 3,100 square feet. These homes typically include two or three bedrooms, two to three-and-a-half bathrooms, and two to three-car garages. 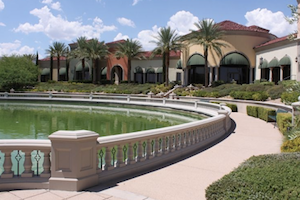 With a fabulous location, impressive amenities and diverse homes, it's easy to see why Siena is a popular choice for active adults in the Las Vegas area.